them as inspiration to make your own graphics. Why are angels depicted as having wings? In the Bible, angels are not described as winged beings. I think that artists gave angels their wings as a symbol of divinity and to indicate that angels were not bound by earthly laws. After all, angels can come and go, and appear and vanish at will. Furthermore, of all the animals of the earth, birds seem to be the freest. So it seems fit that angels sport feathered wings. 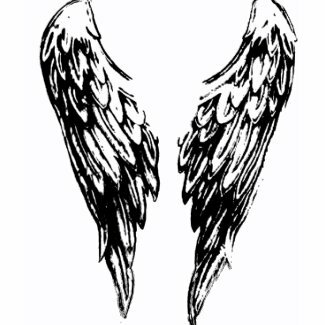 Interestingly, angels are not the only supernatural beings portrayed as having wings. You will find gods and goddesses, fallen angels and demons, and even fictional heroes and villains who display wings. The Ancient Egyptians had the goddess Isis and the Ancient Greeks had the god Hermes. Both deities had wings. Go to this page to learn more about winged creatures. 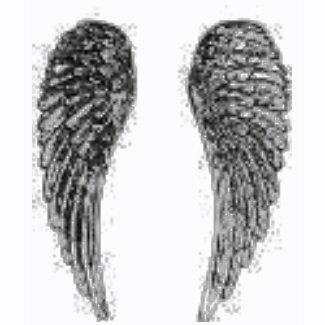 The following gifts and pictures showcase different types of angel wings. 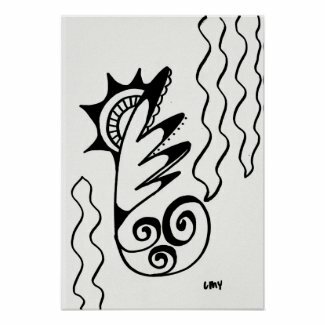 These items are brought to you in affiliation with Zazzle.com. The pictures below are brought to you in affiliation with Art.com. They make great gifts for lovers of all things angel. "How shall we tell an angel from another guest? Treat well whom thou call'st fool'..."
I hope you enjoyed the drawings of angel wings shown here.